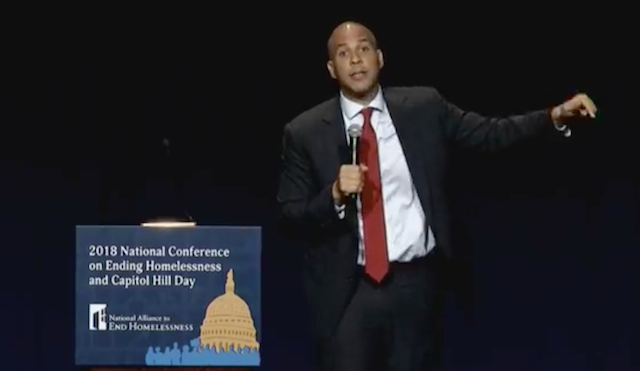 While this is intended to advocate activists to get engaged with Congress people to help the less fortunate you have to remember who Booker is speaking to: Leftists, who are enraged right now with the very people he’s encouraging attendees to confront over homelessness. The problem with this kind of rhetoric, while not violent, is that it will lead to violence. Again it’s only a matter of time until this vicious, vile rhetoric democrat socialist party leaders are using will inspire another Alexandria. WHEN that happens Cory, and most definitely Maxine, will be held responsible. They KNOW they’re preaching to a crowd who vehemently HATE conservatives, GOP and Donald Trump. You cannot say there isn’t a James Hodgkinson hearing speeches like this, but interpreting differently it (in their twisted minds) as these “leaders” giving their full blessing to go on the attack. Harassment = violence to the Left. That’s not theory or hyperbole, it’s fact. These people cannot contain their rage, when they have nothing left to say they attack. It just happened in Massachusetts to Elizabeth Warrens opponent where a Leftist had no response and took a shot at Dr Shiva Ayyadurai. Advocating to your supporters who hate their opposition to get in their faces of their opposition is not going to end well. Again it’s not a question of if, but when another Alexandria or Texas State House of Representatives happens.